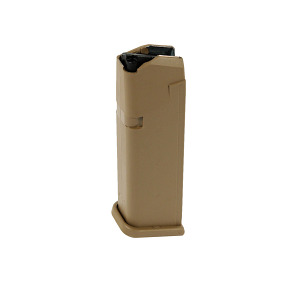 Factory Glock 19X Extended 17 round 9mm coyote tan magazine. Each GLOCK magazine is constructed from a hardened steel insert encased in high tech polymer to protect the magazine and prevent deformation, even when dropped from a great height. The high quality spring and follower ensure reliable feeding from the first round fed by a fully compressed spring down to the last shot. Its double cut magazine body also works with a reversed magazine catch on Gen 4 GLOCK pistol models. These are excellent magazines. Thanks to TGS for fast shipping. Top Gun Supply is still my number one place to buy Sig and Glock accessories! Great prices and great service! New magazine, Gen5, ambi, colored, with orange follower. Perfect!